The 2017 racing campaign continued to add to the legacy of Donny Schatz. It was a season that began in Tulsa and will conclude in St. Louis. 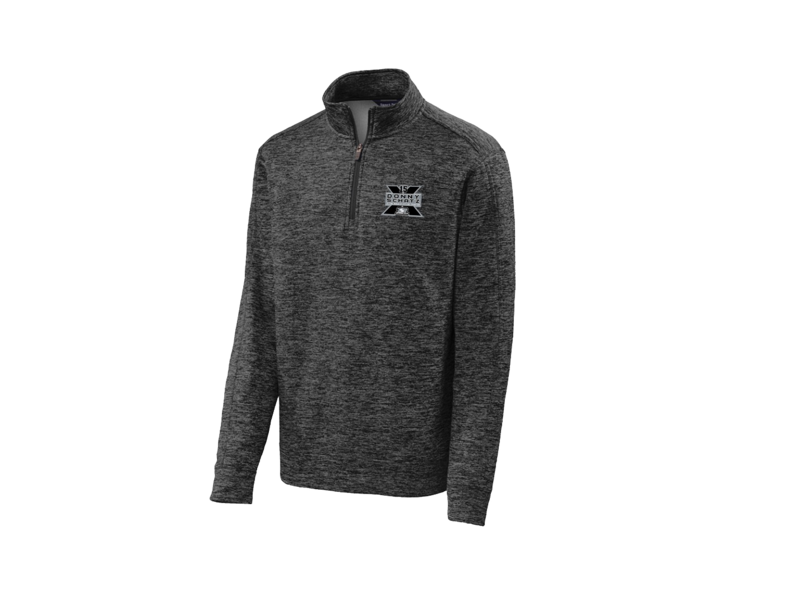 Sandwiched in between was another historic Sprint car racing season that included a record setting performance in the Kings Royal a 10th Knoxville Nationals triumph and a ninth World of Outlaws championship. His 2017 racing season on U.S. soil started in Tulsa for the first time in his career. Schatz finished his Australian tour at Archerfield Speedway in Brisbane, Queensland and the next day was on a flight home. Hours after landing, he was making his first laps in the Tulsa Exposition Center. Schatz made his Chili Bowl debut racing with the No. 15 Arctic Cat Spike driving for Clauson-Marshall Racing. Schatz competed in Tuesday’s Race of Champions and Wednesday night was his qualifying night. He led laps in his second heat race and advanced from 15th to eighth in the preliminary feature. The points earned him the 10th-spot in the B-Feature Saturday night. He worked his way into sixth during the B-Main, but came up one spot short of transferring into the A-Main field. Schatz was named 2017 Chili Bowl Nationals Rookie of the Year. 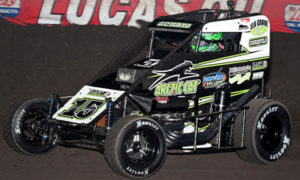 The 2017 Sprint car season started in February with a pair of test sessions at Volusia Speedway Park behind the wheel of a new No.15 Arctic Cat sponsored green and black J&J. The team was fast out of the box when it counted scoring consecutive wins competing with the Arctic Cat All-Star Circuit of Champions at Bubba Raceway Park near Ocala in the season’s first two races. He finished second in the finale before heading to Volusia Speedway for two more All-Star races. Schatz won the opener and finished second in the finale at VSP. After finishing 14th in the Outlaws season opener at Volusia to open his 21st season with “The Greatest Show on Dirt”, he won two A-Features on the same day becoming the first Outlaw since Jeff Swindell, who was in attendance, in 1999 to win two races in one day. 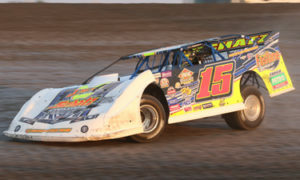 The wins started a five-race winning streak that also included a clean sweep at LoneStar Speedway in Kilgore, Texas and sweeping two nights at The Dirt Track at Las Vegas Motor Speedway. A late-pass of Daryn Pittman at Thunderbowl Raceway in Tulare, California gave Schatz six WoO wins in the first eight races. It was quite a start of the 2017 WoO campaign. He closed March with a runner-up finish in Stockton and used a provisional at Placerville to charge from 25th to 12th. A runner-up finish in Cocopah Speedway in western Arizona highlighted a schedule that took Schatz from Southern California to Arizona back to Texas and finally to Indiana. 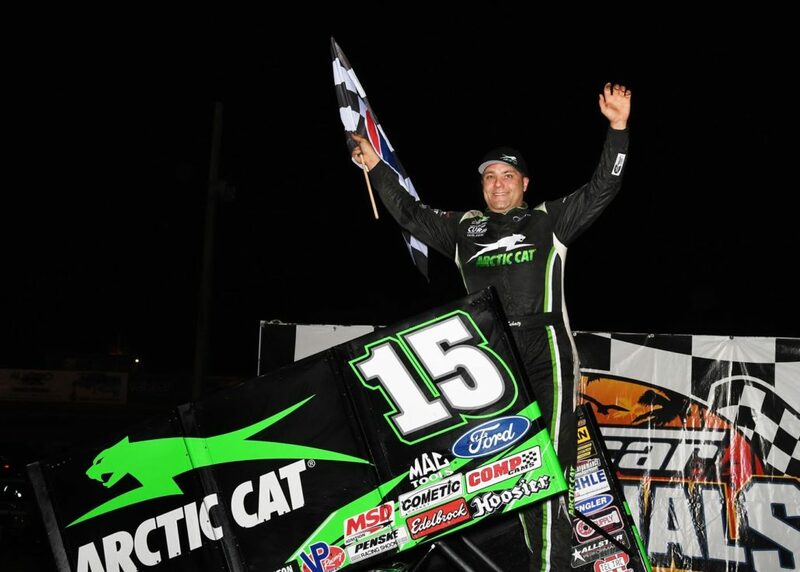 The Arctic Cat team kicked off May with a return to State Fair Speedway in Sedalia, Missouri where Schatz made his first ever Sprint car start back in 1993. Schatz swept the weekend with wins in Sedalia Friday night and at 81 Speedway in Wichita, Kansas 24 hours later. The following week, Schatz raced to victory at Eldora Speedway during Mother’s Day weekend. In all, he scored nine top-fives in 11 starts during May. In June, the three-day Jackson Nationals began with Schatz posting three top-five finishes. The following weekend Schatz finished third in the opener at Knoxville Raceway and came back the following evening by racing to victory to capture his 10th WoO triumph of the season. 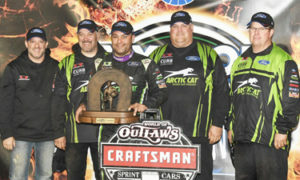 A victory at Granite City Speedway in Minnesota 10 days later continued the teams momentum. 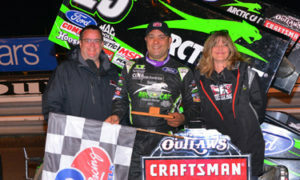 The Outlaws returned to Route 66 Raceway near Chicago during the final week of June and Schatz won in thrilling fashion after starting eight. The next night, he was behind the wheel of his Dirt Late Model competing with the WoO Late Models. Schatz was impressive in the No. 15 Fastlane/Petro Stopping Centers/Schatz Crossroads/DKW Rocket. He was scheduled to start inside the top-six, but Mother Nature washed out the show. 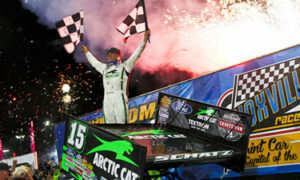 The first of July was another exciting night for Schatz and the TSR Arctic Cat team. He passed Shane Stewart on the final lap of the A-Feature on the half-mile at the Dakota State Fair Speedway in Huron, South Dakota. A pair of third-place finishes at Cedar Lake Speedway the next weekend were followed by a run from 16th to seventh in the Brad Doty Classic at Attica Raceway Park. The “Month of Money” opened with Schatz finishing second in the Knight Before the Royal at Eldora Speedway after starting sixth. The following night, he became the first driver in the Kings Royal 34 year history to win back-to-back $50,000 prizes. He started the evening by setting fast time and winning the opening heat to grab the sixth starting position in the 40-lap Kings Royal. He took the lead on lap 14 and led the final 26 laps to earn his fourth career Kings Royal triumph. Three nights, later he out dueled Sheldon Haudenschild to capture the $25,000 Don Martin Memorial Silver Cup at Lernerville Speedway near Pittsburgh. Schatz opened August with a second-place finish in the opener of the Ironman 55 at Federated Parts Raceway just south of St. Louis. Rain washed out the finale and the team headed northwest towards the Sprint Car Capitol of the World for the prestigious Knoxville Nationals. For the first time since 2011, Schatz returned to event not as the defending champion. He finished second in 2016 and proved he was going to be a factor in the finale after earning the most qualifying points Wednesday night. Schatz shared the front row with David Gravel in the 50-lap finale. Gravel set the pace early, but Schatz took command on lap 23 and never looked back. The win was his 10th Knoxville Nationals A-Feature triumph. The winning ways continued north of the border four days later as Schatz scored a victory in his No. 15 Fastlane Car Wash/Petro Stopping Center/DKW Transport/K3 Farms Rocket at Red River Valley Co-Op Speedway near Winnipeg. The following night, he scored another double by winning both the World of Outlaws A-Feature in his No. 15 Arctic Cat sprinter and the NLRA Late Model feature event. 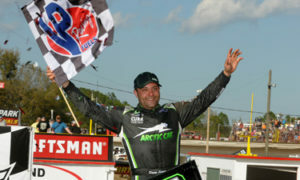 He closed the weekend with a second-place finish at his hometown track of Nodak Speedway in Minot. Three nights later, he made it three straight wins in his Dirt Late Model scoring a victory at Red River Valley Speedway in West Fargo. Schatz continued his quest for a ninth WoO championship through the west with stops in Montana, Washington and Oregon before heading south to Silver Dollar Speedway in Chico for the Gold Cup Race of Champions. Schatz charged forward both nights in Chico before charging from 22nd to fourth Friday night at Calistoga. The following night, led the final seven laps to close out the Wine Country Outlaw Showdown with his 18th WoO triumph. Seven consecutive podium finishes followed including a runner-up finish in the Champions Oil National Open at Williams Grove Speedway in Pennsylvania. He scored his 19th win in mid-October by leading the final 13 laps at Port Royal Speedway. A third-place finish at Lakeside Speedway near Kansas City and a runner-up finish on the high banks of Salina all by clinched the championship leading into the season-ending Textron World Finals at The Dirt Track at Charlotte Motor Speedway. Schatz closed the season almost as strong as he began it by qualifying second for both programs in Charlotte. He won Friday night’s feature and led 25 laps of the season-ending race before finishing second. The victory in the opener was his 20th WoO A-Feature win of the season and marked the fifth consecutive year he won at least 20 WoO races. No other driver in the 40-year history of the Outlaws has been able to accomplish that feat. He concluded his Sprint car portion of the season with 23 total wins, 71 top-fives, and 79-top 10s in 86 starts. Schatz is slated to close his 2017 racing season by competing in the second annual VP Racing Fuels Gateway Dirt Nationals presented by Karl Performance announced it would return to the Dome at America’s Center in downtown St Louis on December 14th-16th, 2017.